Satya Scainetti’s handmade sterling silver piece encourages you to radiate light and joy. Legend has it we're reborn after every moon cycle. 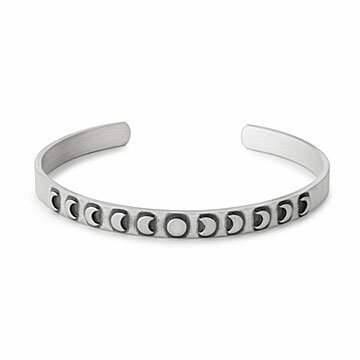 Remember to start fresh and keep looking toward the stars with Satya Scainetti's elegant bracelet. She handcrafts each piece from sterling silver, carving a row of sweet mini moons. A slight shading behind each creates a mystical "glowing" effect, and encourages you to radiate your own light and joy. Give the celestial design to a sky-gazing friend or anyone who could use a gentle reminder to stay bright. Handmade in India.